New mulberries growing on the mulberry plant from Novice Gardener. This is one situation where I have to agree with Mother Weed about pruning plants. Mulberry plants will only fruit profusely if you prune them – hard. It was just two months ago that we noted the slew of fruits developing on our mulberry plant from Novice Gardener, and although they weren’t exactly bountiful, we (and I use the royal “we” here :p ) had great pleasure in being able to pick the fruits off the plants and eat them while making the garden rounds. And yes, we did have to share some with the birds. The same thing that happened to Novice Gardener happened here too – the birds ate part of the fruit and left the top half hanging behind. I wondered why those fruits looked so short until I recalled Novice Gardener’s post. 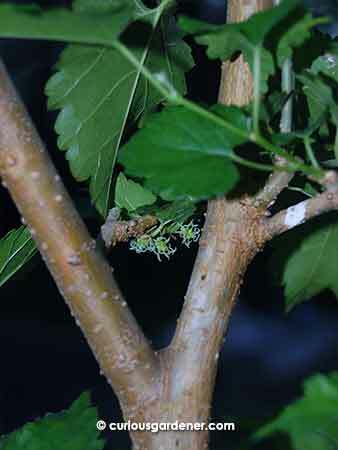 New fruits growing on the smaller variety of mulberry plant. That aside, it was such a pleasant feeling being able to pluck and eat the fruits that I was determined to keep the plant fruiting. So, when the last fruit had been consumed, I immediately pruned the plant all the way back to where the leaves started on each stem. Well, all but one stem – that one had the pumpkin plant attached to it, so I left it alone. Naturally, the plant began growing new stems, and before I knew it, there were new fruits forming! At the same time that I pruned Novice Gardener’s larger variety plant, I did the same to the small mulberry plant while admonishing it that if it didn’t fruit as profusely as its cousin, it would become compost. The moral of this post? 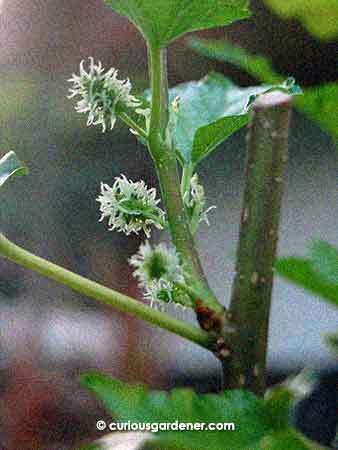 There are times when hard pruning works, and mulberry plants need this to induce fruiting.